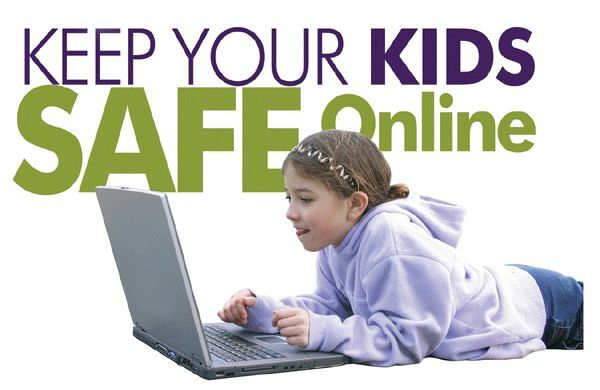 At Cybermums we encourage open discussion with our children regarding their use of the internet and access to online and mobile apps. Following these 7 simple tips for responsible photo sharing can save a lot of heart ache and damage if a photo is shared in haste or without consideration. 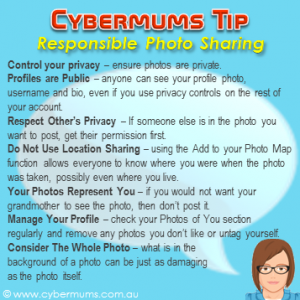 It is important that you have control over your own photos and whether they are private. Most apps have a privacy and security section, usually in the Settings area, where you can specify who can access, see, comment on and share your online photos. Review your privacy settings regularly and keep up to date with the official guidelines for sharing and ownership of photos uploaded to the website or app. Some social networks own your photos once you upload them and can use them for their own purposes if they desire. If an app or website does not have privacy settings then I would strongly suggest not using it. In most social networking sites anyone can see your profile photo, username and bio, even if you use privacy controls on the rest of your account. So using that underage drunk photo of you smashed at the last party you went to, or lounging in your bed might not be the image you want to portray to the whole world. Those photos are best kept off line and definitely not as a profile picture. My dad always said to me, Treat someone the way you would want to be treated. So if you would not like others posting photos online that include you in them, whether the photo is acceptable or not, then you need to consider providing that same courtesy to the people in your photo. And even if you think you dont care about photos others post of you, you should. Any photo of you that is posted by another person does not belong to you and you have no control over its distribution, the same for tagged photos in Facebook. Provide respect for others privacy and you will be afforded the same respect. If someone else is in the photo you want to post, get their permission first and make it clear to your friends they need permission before posting photos that include you. If you see a photo that includes you which you dont like, request the photo to be removed. I consider this very important. Using the Add to your Photo Map function or equivalent in online and mobile apps allows everyone to know where you were when the photo was taken. If it was taken in your front yard, your Mums house, your school yard or your friends house, all these geo-locations are now available. If someone was taking an unhealthy over-interest in you online, they could easily collect this information and get a thorough picture of your movements and locations. The same goes for apps where you check-in to say you are currently at a certain shop/restaurant/business or location. Better to disable this functionality and keep your location and movements private. The best guideline to apply when sharing your photos online is, If you would not want your grandmother/mother/father to see the photo, then don’t post it. A simple rule that has not failed me yet. When people do not know you in real life, which in social networking sites is common, the only way they can get an impression of you is via your online presence, your digital reputation. This means all the comments you make that are public and the photos of you that are not secured and available publicly. Anyone can view them, including potential employers and relatives. Keep your photos private, the same way you would your own photo album at home. You may upload or post photos online quite regularly however privacy and security settings can change or be upgraded by the app owners, or new settings can be implemented that may effect your current photo priviacy settings. It is worth checking your Photos of You section in each of your social and sharing apps regularly and remove any photos you don’t like or untag yourself. Always consider the whole photo before making a decision on posting a photo online. It may be a great picture of you, but it clearly shows in the background the party you told your folks you did not go to or one of your friends in a compromising situation. What is in the background of a photo can be just as damaging as the photo itself, not just to you but to others and your relationships and friendships with people.